MEMPHIS, Tenn. -- The city painted a crosswalk and installed tennis-ball green signs, but the cars just kept on zooming through. But rather than wave a white flag, Sarah Newstok grabbed an orange one instead. The Memphis mother of three zip-tied some recycled plastic shrubbery pots to the signposts on either side of McLean Boulevard and filled them with brightly colored traffic flags. On each bucket is a laminated sign: "Use a flag to help you cross." And voila! She'd committed an act of "tactical urbanism." The trend, which started out as a guerrilla movement but has increasingly gone mainstream across America and globally, can involve something as simple as the corrugated plastic speed limit signs going up around New York City or as large as a "pop-up 'hood" of rehabbed shipping containers to demonstrate the viability of a worn-out Salt Lake City neighborhood. The main criteria for an act of tactical urbanism are that it be simple, relatively inexpensive and quick, says urban planner Mike Lydon. "Tactical urbanism is the use of short-term or temporary projects to test out or to demonstrate the possibility for long-term change," says Lydon, a principal with the New York City-based Street Plans Collaborative, who takes credit for coining the phrase several years ago. Adds Newstok, who works for the group Livable Memphis: "We have to at some point take it upon ourselves to do the types of little projects to make our neighborhoods better, on our own. No one's going to do it for us." Lydon, whose company has published two free online manuals and is in the process of publishing a book on the movement, notes that increasingly "tactical urbanism is being adopted and enabled by cities or developers or nonprofit organizations, and so more frequently it's becoming a sanctioned movement." Many projects are about making cities friendlier. For instance, there's a blog - streetseats.org - dedicated to people who've installed benches and chairs around the country. But making streets safer has also been a big motivator. Two years ago, residents of Brooklyn's Fort Greene neighborhood petitioned New York City's department of transportation to designate two "slow zones" there. The speed limit in New York City is 30 mph, unless otherwise noted. After a lengthy selection process, the Fort Greene request was denied. But when a 9-year-old girl was struck and killed by an SUV that had jumped a curb, residents took matters into their own hands. 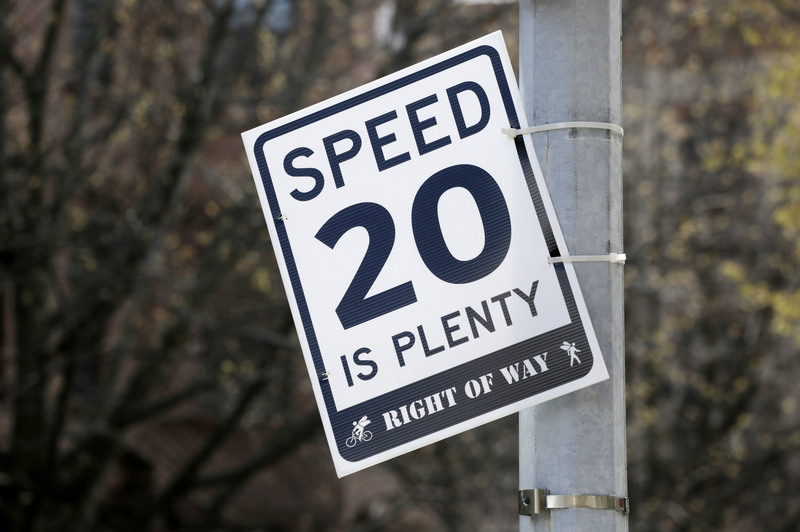 In mid-March, groups spread out across the city and installed corrugated plastic "20 is Plenty" signs - designed by the group rightofway.org - at 11 locations. Organizer Hilda Cohen's two young children wondered: Was it OK to break the rules? "I think it sometimes takes the people to remind the government what they need to do," she says. "You know, this is not infrastructure. It is signage. I mean, we don't need to wait. We shouldn't have to wait." Other projects are about attracting traffic to a neighborhood. Last year in Salt Lake City's rundown warehouse district, the nonprofit Kentlands Initiative converted shipping containers into "micro-retail" spaces and arranged them in the middle of a wide, sparsely traveled street, dubbing this "Granary Row." The goal of this "pop-up 'hood" - complete with food trucks, a community garden and a performance stage - was to attract entrepreneurs, show they could make money there and encourage them to set up shop permanently. All three of the startups that took part have since moved into permanent retail space, says Kentlands executive director James Alfandre. Granary Row is reopening May 23 on a vacant parking lot. "The most important thing is that we become a thriving version of what we already are, and not something else," he says. Several major cities have embraced the concept - and even expanded on it. Through its People St. program, the Los Angeles Department of Transportation offers kits and materials to help business and neighborhood groups transform sidewalks and even portions of streets into "parklets." New York has a similar program. On a recent windy day in Brooklyn's Dumbo (Down Under the Manhattan Bridge Overpass) neighborhood, Wendy Bronfin took her 4-year-old daughter for a scooter ride in a park that was once a parking lot. "There's a lot of families in this neighborhood and we use the outdoor space, whether it's for carnivals or different events," she said. Not everyone is thrilled with these vigilante actions. Last year, police in Vallejo, Calif., arrested Anthony Cardenas for vandalism after he painted diagonal stripes over an existing crosswalk to make it more prominent. The charge was dismissed earlier this year. And officials in Hamilton, Ontario, ordered several crosswalks and sidewalk "bump outs" removed after Lydon and others held a workshop there last spring. The city later reconsidered and is now replicating the projects. Some officials have argued that these projects, however well-meaning, can actually endanger people. Lydon says he's unaware of injuries resulting from one of these projects, and calls their track record "outstanding." Memphians have adopted tactical urbanism in many ways. On Main Street, a bocce ball court now beckons restaurant and bar patrons to regular tournaments. And hand-painted bicycle lanes are part of an effort to breathe life back into long-neglected Broad Avenue. The latest and largest example of tactical urbanism here is "Tennessee Brewery Untapped." Abandoned and decaying for a half century, the fortress-like brick building has become a home for pigeons and a canvas for graffiti artists. Tommy Pacello, a member of Mayor A.C. Wharton's innovation delivery team, says the owners have spent more than a half-million dollars in recent years just to protect the 124-year-old building from vandals. "Since '97, there have been 14 feasibility studies done on this project," Pacello says. Abandoning the "old calculus" of trying to "build out the entire thing at once," he and a group of others decided to try a different approach. For six weeks through June 1, organizers will operate a pop-up beer garden in the old courtyard. Volunteers crafted seats, tables and even a performance stage out of donated and scrap lumber, and food trucks are lined up to provide refreshments. "It's intended to activate it," Pacello says. "It's to demonstrate that there is value in the structure, that people are compelled to be down here." With demolition scheduled to begin in August, Pacello and the other tactical urbanists don't have long to demonstrate that a white elephant can become a cash cow.